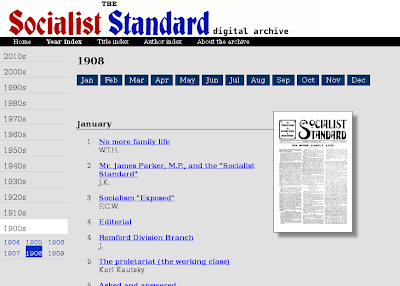 I've produced a quick mock-up of what a web browser–based interface to the Socialist Standard archive might look like. Follow the link below to see a working copy. I don't know the hOCR format in detail, but I suspect that having two whitespace-containing ocrx_word spans in a row isn't prohibited. It's therefore probably PDFBeads which is at fault here. The next steps are therefore to process the Tesseract output with sed to find and remove the duplicate whitespace spans. Following that it looks like my OCR job is complete, and the only really necessary remaining work is to build some HTML-based UI to access the PDFs. So I wrote to Alexey Kryukov, author of PDFBeads, alerting him about his program's inability to handle input files where the horizontal and vertical DPI differ. I never heard back. I also did some further research on manually changing the output PDF resolution, but from what I can tell this isn't possible. So it looks like I'll just have to override the DPI settings in the original TIFFs and live with slightly stretched or compressed page sizes. It looks like this problem has been reported at least a couple times before on the Tesseract issue tracker (Issue 541, Issue 788). Comments on the second report suggest the problem may have been solved in Tesseract 3.02, which was released a few days ago. This version hasn't yet been packaged in Lazy Kent's repository, so I can either wait to see if he updates the RPM, or try producing one myself using his spec file and patches. I had a chance to visually examine the output of PDFBeads, and so far it looks OK. I think I will keep the unpapered backgrounds. Postprocess the output PDF to override the DPI or paper size settings. I'm not sure if there's any easy way of doing this. Use ImageMagick's convert --density to override the input TIFF DPI so that the vertical and horizontal DPI values are the same. This will result in distorted images, however. Further to my post of yesterday, I downloaded and installed PDFBeads, a Ruby tool for assembling images and hOCR data into PDFs. Unlike hocr2pdf, PDFBeads supports JBIG2, and is also able to up- or downscale the page image to a specified DPI. In theory this means it's no longer necessary to call jbig2enc separately. Also, unlike jbig2enc's pdf.py, PDFBeads inserts a JPEG or JPEG2000 foreground image of the original page, though whether or not this is desirable depends on the source material. For my microfiche scans, it's not particularly helpful: some of the scans are quite dark, so I would rather have bitonal, text-only images which print with higher contrast and less ink. Also, large areas of these images have been blanked by unpaper, so it's possible some of them may look a bit ugly. I'll have to examine the results to see whether they're acceptable. One need give only the image files on the command line; it tries to find matching hOCR files automatically based on the image filenames. For example, if you call pdfbeads foo.tiff then it will look for hOCR data in the file foo.html. Frustratingly, however, it looks for this file in the current directory, and not in foo.tiff's directory, so calling pdfbeads /path/to/foo.tiff won't work if the hOCR data is in /path/to/foo.html. The tool leaves a lot of temporary files lying around. To be fair, this is a good thing, since they are expensive to produce and you wouldn't want to recreate them on each run unless necessary; there's also a command-line option to delete them. The problem is that where these files are produced is neither documented nor specifiable. This issue, plus the one mentioned in the previous point, make it a bit more difficult to cleanly use the tool in a batch environment such as a shell script or makefile. The program doesn't always throw an error when things go wrong—for example, if you try to invoke it on a PNG image, it will happily produce a blank PDF instead of informing you that it can't handle PNG files. It took some trial and error to find an image file format that it liked (TIFF). Even when called with the correct arguments, the program sometimes ends up producing a 0-byte PDF file. I let it run overnight to produce PDFs for 820 issues of the Standard, and in about a dozen cases it produced a 0-byte file. However, when I tried rerunning the tool on these cases, in all but one it successfully produced the PDF. So evidently it's a bit flaky. The tool still failed on one of my newspaper issues, throwing the error /usr/lib64/ruby/gems/1.8/gems/hpricot-0.8.5/lib/hpricot/parse.rb:33: [BUG] Segmentation fault. The problem is evidently an insidious and often-reported bug with hpricot, the HTML parser PDFBeads uses to process the hOCR files. There was nothing obviously wrong with the particular hOCR file that hpricot was choking on; and I found that making almost any trivial modification to it (such as adding another newline to the end of the file) allowed hpricot to process it without error. In one of my recent posts an anonymous commenter alerted me to the existence of the DIY Book Scanner website, and more specifically its forum. The forum looks to be an excellent resource for anyone doing their own book (or newspaper) scanning project, and contains areas for discussing both hardware and software workflows. It's there that I first learned about PDFBeads (more on which in an upcoming post). You will recall that the page images originally supplied to me were DCT images embedded in PDFs, DCT being a lossy compression scheme based on the JPEG standard. I needed to crop, deskew, and OCR these images, for which I had to decompressed them to bitmaps. The finished PDFs I ultimately produce will use lossless JBIG2 compression on the scans—or so the plan is. and recompile, maybe hocr2pdf will no longer lossily compress the PNGs I feed it. You will recall that I got the best-looking results from jbig2enc when I set it to upscale the images by a factor of two. However, pdfsizeopt doesn't appear to let you change the scaling factor. Since pdfsizeopt is just a Python script which calls jbig2, I should be able to just add -2 to the system call at that point. I could instead use something called PDFBeads. According to a thread on DIY Book Scanner, PDFBeads is a Ruby application which can add hOCR to PDF. However, the reader is warned that the "manual [is] in Russian only"! This could be fun.